Air101: 2018 was a year of challenges for Airbus but profits still rise. 2018 was a year of challenges for Airbus but profits still rise. There is no doubt that 2018 held many challenges for the European aircraft and aerospace giant, Airbus, not least it's A380 programme and slow uptake of orders for the A330neo jets. However, despite various difficulties, the firm still saw revenue and profit rise. Net commercial aircraft orders totalled 747 (2017: 1,109 aircraft), including 40 A350 XWBs, 27 A330s and 135 A220s. Showing the underlying health of the market, the order backlog reached an industry record of 7,577 commercial aircraft at year-end, including 480 A220s. (4) Net helicopter orders increased to 381 units (2017: 335 units) with a book-to-bill ratio above 1 in terms of both value and units. Order intake included 15 H160 and 29 NH90 helicopters. Airbus Defence and Space’s 2018 order intake of around € 8.4 billion included the Eurofighter for Qatar, four A330 MRTT tanker aircraft and two new generation telecommunication satellites. Consolidated order intake(4) in 2018 totalled € 55.5 billion with the consolidated order book(4) valued at € 460 billion on 31 December 2018 under IFRS 15. Consolidated revenues increased to € 63.7 billion (2017: € 59.0 billion(1)), mainly reflecting the record commercial aircraft deliveries. 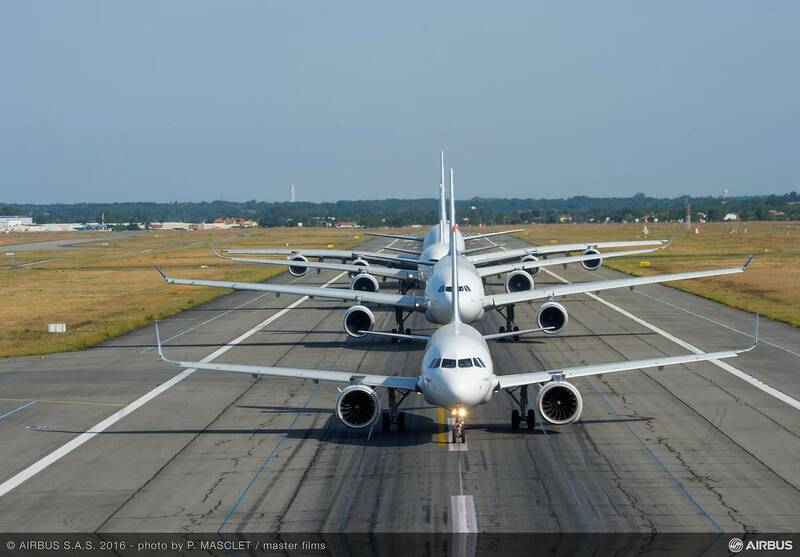 At Airbus, a total of 800 commercial aircraft were delivered (2017: 718 aircraft), comprising 20 A220s, 626 A320 Family, 49 A330s, 93 A350s and 12 A380s. Airbus Helicopters delivered 356 units (2017: 409 units) with revenues stable year-on-year on a comparable basis despite the lower deliveries. Higher revenues at Airbus Defence and Space were supported by its Space Systems and Military Aircraft activities. € 5,834 million (2017: € 3,190 million(1)), reflecting the strong operational performance and programme execution across the Company. Airbus’ EBIT Adjusted increased to € 4,808 million (2017: € 2,383 million(1)) reflecting the higher aircraft deliveries. The strong improvement compared to 2017 is driven by progress on the learning curve and pricing for the A350 as well as the A320neo ramp-up and pricing premium. Currency hedging rates also contributed favourably. Following a review of its operations, Emirates is reducing its A380 orderbook by 39 aircraft with 14 A380s remaining in the backlog yet to be delivered to Emirates. As a consequence of this decision and given the lack of order backlog with other airlines, deliveries of the A380 will cease in 2021. The recognition of the onerous contract provision as well as other specific provisions and the remeasurement of the liabilities have led to a negative impact on EBIT of € -463 million and a positive impact on the other financial result of € 177 million. Airbus Helicopters’ EBIT Adjusted increased to € 380 million (2017: € 247 million(1)), reflecting higher Super Puma Family deliveries, a favourable mix and solid underlying programme execution. Airbus Defence and Space’s EBIT Adjusted totalled € 935 million (2017: € 815 million(1)), mainly reflecting solid programme execution. On the A400M programme, 17 aircraft were delivered during the year (2017: 19 aircraft). 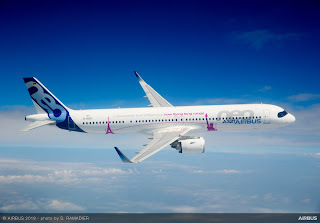 Airbus continued with development activities toward achieving the revised capability roadmap. Retrofit activities are progressing in line with the customer agreed plan. The customer Nations are now set to pursue their domestic approval processes. An update of the contract estimate at completion triggered a net additional charge of € -436 million on the programme. This mainly reflects the outcome of the negotiations and updated estimates on the export scenario, escalation and some cost increases. Risks remain on the development of technical capabilities and the associated costs, on securing sufficient export orders in time, on aircraft operational reliability in particular with regards to engines, and on cost reductions as per the revised baseline. Consolidated self-financed R&D expenses totalled € 3,217 million (2017: € 2,807 million). A negative € -81 million related to other costs. Consolidated net income(2) of € 3,054 million (2017: € 2,361 million(1)) and earnings per share of € 3.94 (2017: € 3.05(1)) included a negative impact from the financial result, mainly driven by the evolution of the US dollar and revaluation of financial instruments. The other financial result also included the positive adjustment of € 177 million from the A380. The finance result was € -763 million (2017: € +1,161 million(1)). Consolidated free cash flow before M&A and customer financing was stable at € 2,912 million (2017: € 2,949 million) including the A220 dilution, supported by the earnings performance and record deliveries. Consolidated free cash flow of € 3,505 million (2017: € 3,735 million) included around € 0.5 billion related to M&A activities. The consolidated net cash position on 31 December 2018 was stable at € 13.3 billion (year-end 2017: € 13.4 billion) after the 2017 dividend payment of € 1.2 billion and pension funding of € 2.5 billion, including € 1.3 billion in the fourth quarter. The gross cash position was € 22.2 billion (year-end 2017: € 24.6 billion). The Board of Directors will propose to the Annual General Meeting the payment of a 2018 dividend of € 1.65 per share on 17 April 2019 (2017: € 1.50 per share). This reflects the strength of the 2018 achievements. The date of record is 16 April 2019. 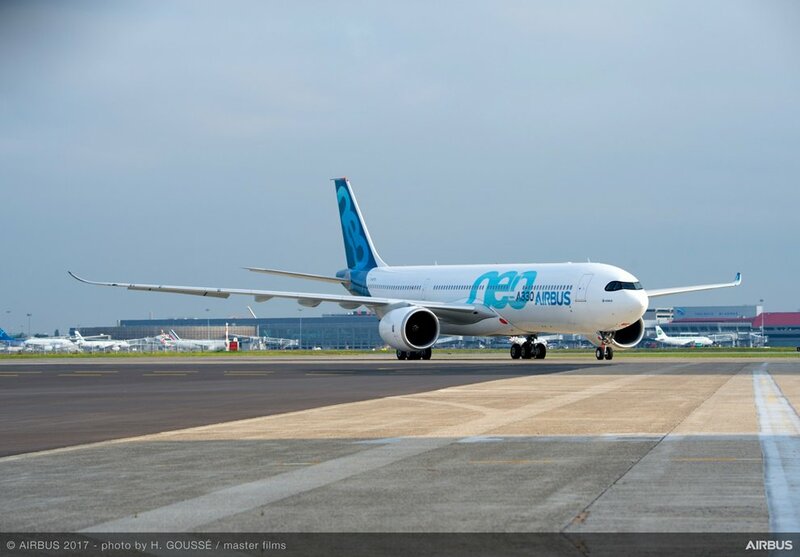 Airbus targets 880 to 890 commercial aircraft deliveries in 2019. 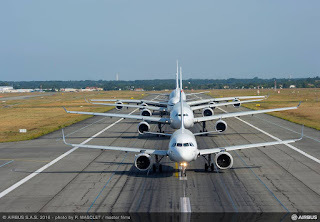 On that basis: Airbus expects to deliver an increase in EBIT Adjusted of approximately +15% compared to 2018 and FCF before M&A and Customer Financing of approximately € 4 billion. For footnotes please refer to page 11. Q4 2018 EBIT (reported) increased by 138% to € 2,365 million. It reflected net negative Adjustments of € -731 million booked in the quarter. Net Adjustments in the fourth quarter of 2017 amounted to a net € -990 million. Q4 2018 Net Income increased 66% mainly driven by the higher EBIT. It was lowered by the finance result of € -350 million from the evolution of the US dollar and revaluation of financial instruments. In Q4 2017, the finance result was positive at € 1,060 million. The Company continues to use the term EBIT (Earnings before interest and taxes). It is identical to Profit before finance result and income taxes as defined by IFRS Rules. Adjustment, an alternative performance measure, is a term used by the Company which includes material charges or profits caused by movements in provisions related to programmes, restructuring or foreign exchange impacts as well as capital gains/losses from the disposal and acquisition of businesses. The Company uses an alternative performance measure, EBIT Adjusted, as a key indicator capturing the underlying business margin by excluding material charges or profits caused by movements in provisions related to programmes, restructurings or foreign exchange impacts as well as capital gains/losses from the disposal and acquisition of businesses. EPS Adjusted is an alternative performance measure of basic earnings per share as reported whereby the net income as the numerator does include Adjustments. For reconciliation, see slide 20 of the Analyst presentation. The Company defines its consolidated gross cash position as the sum of (i) cash and cash equivalents and (ii) securities (as all recorded in the consolidated statement of financial position). For definition of the alternative performance measure net cash position, see Registration Document, MD&A section 2.1.3. For the definition of the alternative performance measure free cash flow, see Registration Document, MD&A section 2.1.3. It is a key indicator which allows the Company to measure the amount of cash flow generated from operations after cash used in investing activities. Free cash flow before mergers and acquisitions refers to free cash flow as defined in the Registration Document, MD&A section 2.1.6.1. adjusted for net proceeds from disposals and acquisitions. It is an alternative performance measure and key indicator that reflects free cash flow excluding those cash flows resulting from acquisitions and disposals of businesses..
Free cash flow before M&A and customer financing refers to free cash flow before mergers and acquisitions adjusted for cash flow related to aircraft financing activities. It is an alternative performance measure and indicator that may be used from time to time by the Company in its financial guidance, esp. when there is higher uncertainty around customer financing activities, such as during the suspension of ECA financing support. Where applicable, 2017 figures have been restated to reflect the adoption of the IFRS 15 accounting standard and new segment reporting as of 1 January, 2018. The new segment reporting reflects the merger of Headquarters into Airbus. 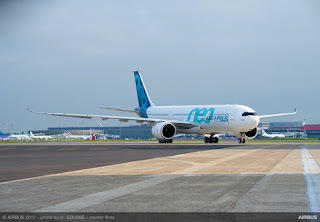 Where applicable, ‘Airbus’ refers to commercial aircraft and the integrated functions while ‘Airbus Consolidated’ or ‘the Company’ refers to Airbus SE. Airbus SE continues to use the term Net Income. It is identical to Profit for the period attributable to equity owners of the parent as defined by IFRS Rules. To be proposed to the Annual General Meeting on 10 April 2019. The order backlog and order intake is measured under IFRS 15. The unit backlog reflects the contractual view. The backlog value now reflects the assessment of recoverability and net transaction price on airframe and engine. The 2017 backlog is not being restated.